One of the reasons I love the Extraordinary Form is that within the rite, there are a lot of lovely little ceremonies that either didn’t survive the liturgical reform, or they survived in name only. The Asperges Me is one such ceremony. While it is technically still available, it is one option among many, and its replacement is typically a (forgive the pun) watered down “sprinkling ceremony.” (During Easter it is suggested the Asperges be traditionally sung however.) Holy water being Holy Water, it still acts as a sacramental, but we lose a lot of the powerful symbolism this rite has. To understand the significance of this rite, it helps to understand why the Mass is so significant. At this point you might expect the cliché that the Mass is the timeless sacrifice of Christ on the Cross made present in time and space, but we need to ponder what that actually means, and what our response is to that. God has offered forgiveness and redemption to man throughout history, and while some have accepted it, most have rejected it. In the Cross we find the fullness of God’s redemptive offer. Since man was rejecting the blood of bulls and goats, and had no use for the ashes of the heifer (Hebrews 9:13), God debased Himself by becoming man, born of a simple country girl. During His life on earth, Christ shows that the path to redemption is through abandoning your desires and instead focusing on God. He shows the depth of that in the Cross. When we go to Sunday Mass, we are accepting (however imperfectly) that way of life. When Adam sinned, he fled from God. When we sin, we approach Jesus Christ, the “propitiation for our sins and the sins of the whole world.” (1 John 2:2) In our own little way, we are reversing the trend of humanity to reject God’s gifts and calling. The next great saint or pope might come to Mass for the first time next Sunday. When you make this kind of committment, you are bound to catch the attention of certain unsavory characters. Throughout history the devil has done what he can to turn people away from God. Due to the nature of Christ’s sacrifice, the devil is powerless to make people stray from the faith through outside means of interference. (Romans 8:28-30) The only way he can make us fall is by using the same trick he did with our first parents: causing us to doubt God’s love for us, and God’s plan for us. 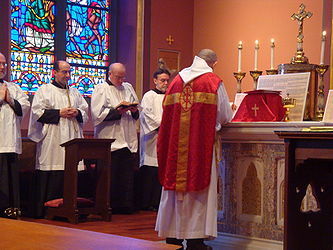 In the context of the Mass, the devil can encourage us to take the liturgy lightly. He can encourage the priest to give into liturgical abuse. He can inspire you to focus more on the cute blonde a few pews in front of you instead of on the altar. Make no mistake, the devil will try all of these things and plenty more. He knows that the moment you approach the foot of the cross, he loses all power and influence over you. At the foot of the cross not only are we washed in His blood and sprinkled by the water from the pierced side, but we have two powerful examples to follow. We have the example of Mary, who was the disciple of Christ par excellence. Like John, we are her spiritual children, and she will do all she can to ensure we follow her Son. We also have St. John the Evangelist, the Apostle who understood the Gospel with a depth that came from leaning at Christ’s breast as a child, and living and contemplating it for the next six decades. The devil hates the Cross, not only because of the One crucified, but because at the feet of the Cross we are given examples to emulate. Hear us, O holy Lord, almighty Father, everlasting God, and vouchsafe to send Thy holy Angel from heaven, to guard, cherish, protect, visit and defend all that are assembled in this place: through Christ our Lord. Amen. We tend to forget that every Church is given a guardian angel. Now we should be able to see why! Before the start of every Mass we are on our way to the foot of the cross, and the devil will do anything he can to keep us from there. The angels become at this point not abstract beings in heaven, but our protectors who keep evil at bay so we can reach the foot of Calvary. That angel is there for us even when we exit those Church doors. Let us always call upon this angel so we can always have refuge at the foot of the Cross.